"Rennie's Wholesale Price List - 1936 - Wm. Rennie Seeds - Toronto." 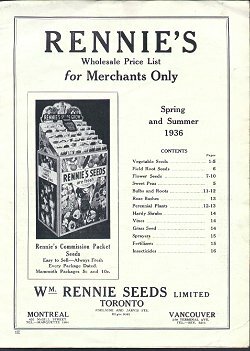 (1494) Rennie's Wholesale Price List - 1936 - Wm. Rennie Seeds - Toronto. -Condition: Good Plus Seed catalog and price list. Divided into sections of vegetables, field root, flower, sweet peas, bulbs, rose bushes, perennials, hardy shrubs, vines, grass seed, sprayers, fertilizers, and insecticides. Catalog measures 7 1/2" by 10 1/2" and has 16 pages. There is a torn corner in the bottom right of the catalog. There is some writing on the back page. Catalog has two illustrations. Price: $4.00 + shipping.